Eggs—long symbols of fertility, rebirth, and love—inundate just-budded trees throughout eastern Pennsylvania each spring. 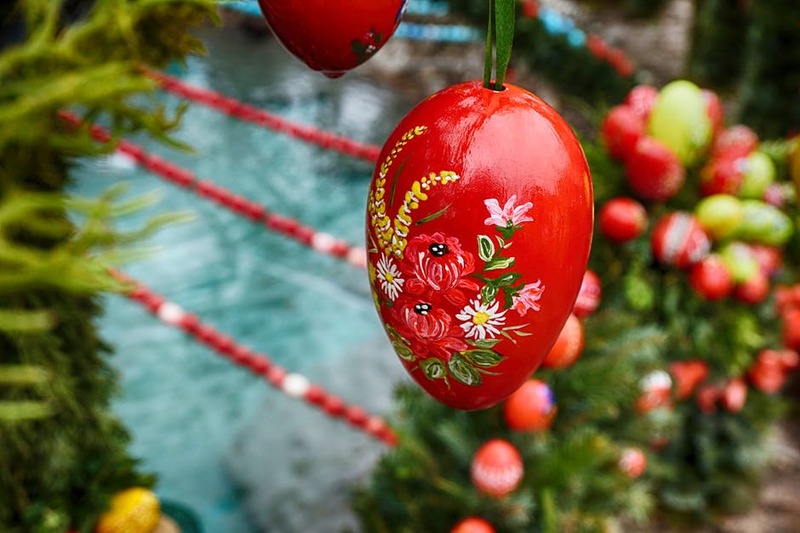 While most states celebrate Easter with rabbit figurines, church festivals, and large baskets filled with chocolate gifts, “Easter egg trees” sprout up in American regions that still hold fast to Old World ways. In specific, areas “settled” by Eastern and Northern European immigrants still practice traditions stemming back to Germanic and Scandinavian roots. In the counties surrounding Philadelphia, including the Lehigh Valley where these migration patterns merged and collected, this “East Coast” tradition began as a folk custom practiced by Moravian, Swedish, Pennsylvania Dutch, Germanic, Ukrainian, and Polish families. Egg symbology predates its commonly perceived Christian context, as many folklorists would guess. However, the way this symbol is handled says much about how this ancient tradition has been diversely acculturated. Simply consider what verbs we attach to this emblem of burgeoning life: We decorate eggs, color them, roll them, tape them, fill them with confetti and money. We throw them, collect them, display them. Hunt them. But why do we “tree” them? Whether natural or artificial, eggs are more than a humdrum token of rebirth; they are a promise. Looking beyond and before Christian traditions, questions arise. Was this ritual a sacrifice? A warding? Were these reminders of fertility hung from empty, wintered branches as a plea to usher in spring? While as symbols they are, of course, metaphorical, to our ancestors their promise was all too real. 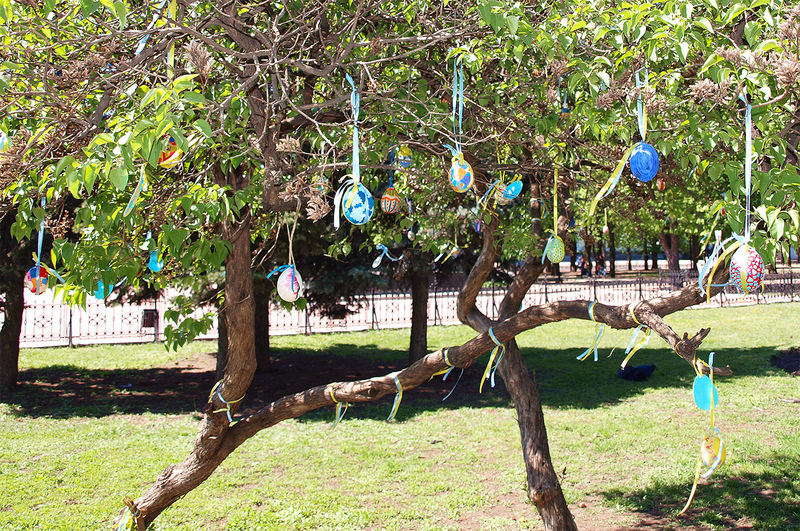 An Easter egg tree, or Ostereierbaum, stays up throughout the Easter season whether indoors or out. Some Pennsylvanians keep the tree decorated year-round, swapping out the eggs as frequently as flowers—as if the décor might go stale. Most often made of ceramic, glass, or porcelain, the spring season revels in displaying the careful, handcrafted painting of artists who work in the miniature. These patterns change by culture: from laced elegant designs to gilded geometric patterns to framed springtime depictions. Pastel blue, cream-washed or purple-dyed—fluorescent pink, electric green, or buzzing blue—these eggs hang, muted or bright, from ribbons outside the brick homes of the East Coast. It is a tradition hard to explain to those from other regions—a baffling swirl of color amidst the ending grey of winter. And in a state such as Pennsylvania, a region known for mountains, coal, and steel, it’s a fascinating juxtaposition to pair fragile shells alongside brisk windy springs and mountain skylines. In another turn of decoration, in Sweden, feathers are often hung or placed alongside arrangements of eggs and twigs in vases. Sweden may have taken up this particular tradition after its Sack of Moravia during the Thirty Years’ War, but even these relatively recent origins are dubious as some older folk beliefs report the addition of feathers to be emblematic as “sweeping” away the midwinter cold. Alternative etiologies detail that the decorated twigs are reminiscent of a flying witch’s broom (paskaringar). This belief aligns nicely with Sweden’s custom of dressing up children like witches to collect eggs on Easter. Long before they were merely generic holiday periphera, eggs were additionally used as apotropaics and talismans; it was once believed that to carry three fresh eggs in a pocket into church gave one the sight to see which members of the community were witches. In Christian folk belief the suffering of Jesus may have been an added connotation of the twigs, which the Swedes once (and sometimes still) used as “switches” on family members as reminders of this trial; the eggs symbolizing, therefore, his resurrection. 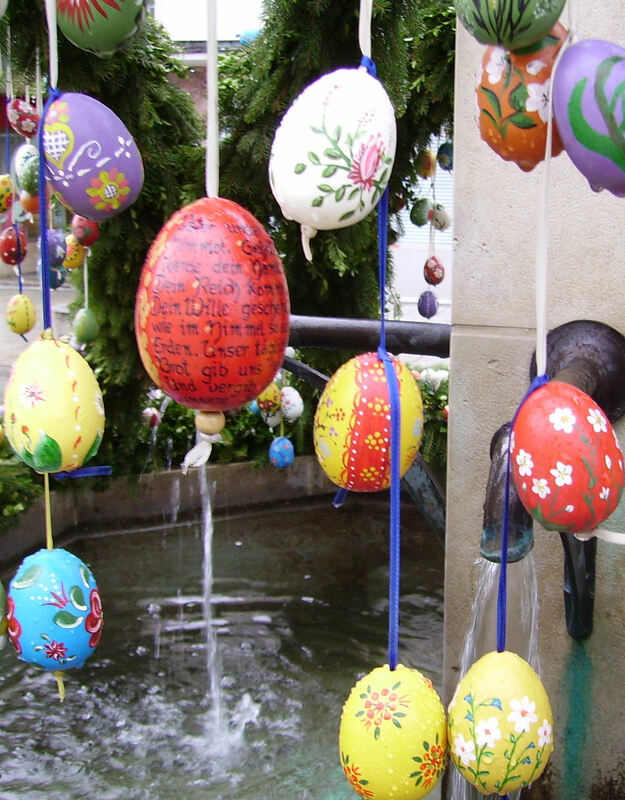 The Easter egg tree is a custom that spans across the Atlantic Ocean, connecting Scandinavia and Europe to immigration trails within the United States. From homemade knick-knacks to mass-produced ornaments, this shared cultural practice is more than mere pretty decoration. A symbolic token of fertility awakening the season of renewal, eggs bloom from empty branches year after year: an ouroboros of life and tradition. Kaufman, Cathy K. “The Egg Tree in America”, Eggs in Cookery: Proceedings of the Oxford Symposium of Food and Cookery 2006. Ed. Richard Hosking. Jennie Ziegler, a native Pennsylvanian, received her nonfiction MFA at the University of Arizona, and currently resides and teaches in Florida. 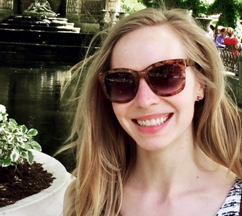 She specializes in writing hybrid texts of fairy tales, retellings, region, women’s narratives, and memoir. Follow Jennie on Twitter or visit her website.